← Heading East this Thursday night! Tomorrow’s practise session takes us to Eastern Europe where we’ll explore the sound of klezmer music and revive our theme song from last year, Uskudar. Visit the Tunes page for audio downloads and sheet music. 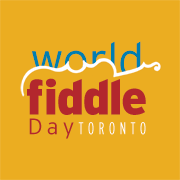 Join our practise jam at Long & McQuade’s clinic space (935 Bloor St. W.) from 1 to 3 – World Fiddle Day at Fort York is less than 1 month away! The next practice is May 15th, 12-3pm.